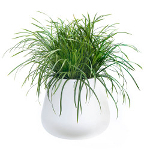 The Sphere planter range has a hand made ceramic feel but is made from strong, light weight GRP (glass reinforced plastic). 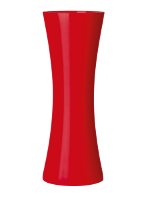 Five sizes available in bold gloss or matt RAL colours. 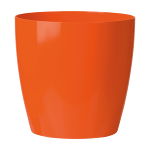 Phoenix Round A range of elegant plastic planters of exceptionally high quality, available in six sizes and any standard RAL colour. A stylish planter for use indoors or outside. 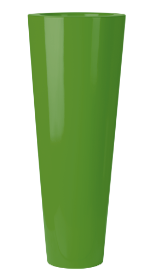 Phoenix Tall Vase A range of elegant plastic planters of exceptionally high quality, available in three sizes and any standard RAL colour. A stylish planter for use indoors or outside. Phoenix Square A range of plastic planters of exceptionally high quality, available in five sizes and any standard RAL colour. A stylish planter for use indoors or outside. 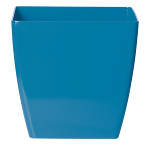 Phoenix Tall Square A range of modern plastic planters of exceptionally high quality, available in three sizes and any standard RAL colour. A stylish planter for use indoors or outside. 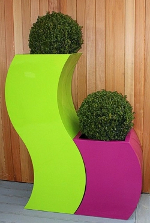 Lechuza delta A range of contemporary plastic planters that are ideal for specimen planting. Available in three sizes and 3 colours. A stylish planter for use indoors or outside. 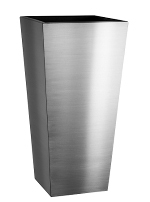 The Column range is a modern GRP tall round planter available in four diameters and many heights. Finished in bold gloss BS 4800, RAL and metallic colours. 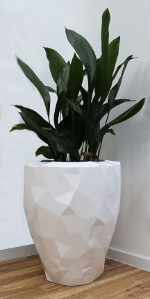 The Elho Pure Cone range of planters offers a beautifully organic shape that looks stunning indoors or out. They can be arranged individually or in a group to great effect. Boxy planters Cubes and tall square towers. 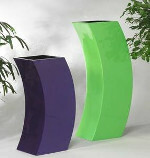 These come in many sizes, numerous colours and are made from durable fibreglass. 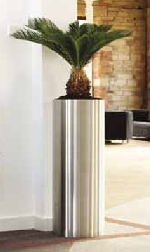 Cono planters Elegant tapered pillars with a small foot print that will add a touch of contemporary class to any location. Ovation planters are a modern classic offering both floor standing tall vases and bowls that are perfect on a desk, table or cabinet. Made in Holland from quality Eco-Synthetic resin and available in all standard RAL colours. 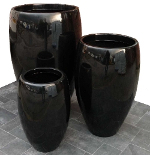 Cuban planters are stylish vase shaped plant pots with wide shoulders ideal for specimen planting. 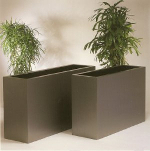 Troughs A variety of sizes from cabinet top planting to large floor standing statements. 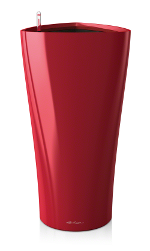 Available in any standard RAL colour, matt or gloss finish. 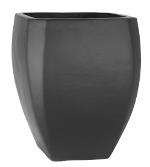 The Belly Pot is a classic shaped planter with a ceramic style finish made from durable GRP (glass reinforced plastic). 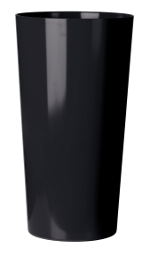 Available in any standard RAL colour, matt and gloss finishes. 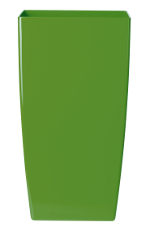 The elegant Symmetry made from quality Eco-Synthetic resin have a unique hourglass shape and are available in any standard RAL colour with a gloss or matt finish. Maceta Giant These timeless large flower pots are the perfect shape for mixed or specimen planting and can be used inside or outdoors. The Stadium planter's elegant curves will look superb in any inside or outside displays. All RAL colours available. Slinky planters They can be used on their own or in any combination, each unit perfectly blending with each other. 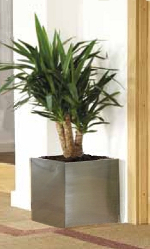 The Facet planter offers instant elegance to any room or space and looks great from any angle. Bowl planters A classically shaped plant pot that is well suited to both interior and exterior planting. 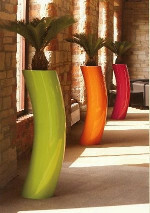 The Vase range of planters offers a choice of modern hand made pots in durable spun aluminium. The Standard range is a selection of classically shaped spun aluminium planters in a variety of sizes from desktop planting up to large floor standing. 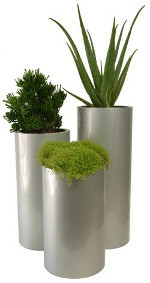 Aluminium column A contemporary planter hand made in Britain to the highest standard from brushed aluminium. Stainless steel cube are British made from 304 grade brushed stainless steel. A modern chunky planter. 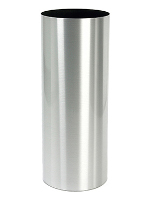 Stainless steel column A neat tall planter hand made in Britain to the highest standards from brushed stainless steel. 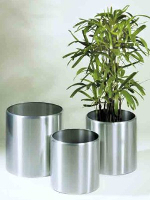 Stainless steel tapered square These quality British made brushed stainless steel planters are available in three heights.